Since the present behavior for the issue is different, the updated description is provided below. The previous description of the issue is moved to Comments. 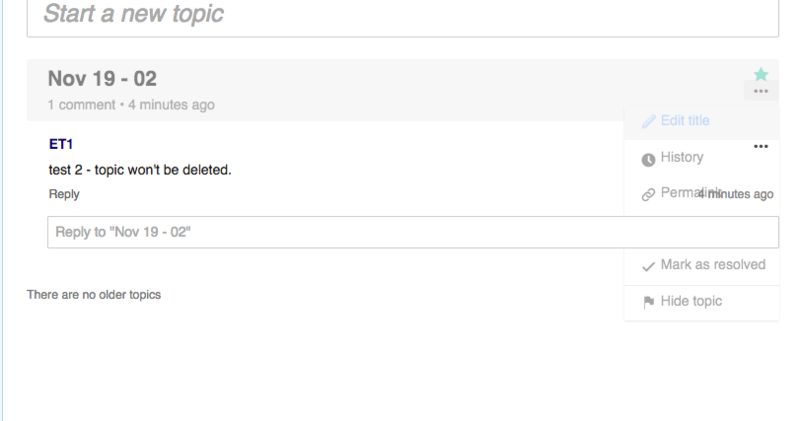 Two cases - 1) a topic was deleted when another user attempt to post/add new topic 2) The Flow board (a page was deleted). First user deletes a topic while another user was viewing the topic (the topic is displayed on the second user screen). The second user attempts to add a new topic or a new post. For a new topic the error message displays confusing 'vppermissions'; for adding a post the error message is ok. Note: there are no other, previously reported issues - i.e. 'dimmed' drop-down menu, odd 'discard exchanges' VE pop-up, or 'Conversion from 'topic-title-wikitext' to 'html' was requested...'. A Flow board was deleted. • Mattflaschen-WMF added subscribers: jmatazzoni, SBisson, • Mattflaschen-WMF. I don't see the topic-title-wikitext message. (I didn't know exactly how to reproduce since it just says "a non-privileged user attempts to edit or to post a reply to a deleted topic"). It still lets you try to save in this situation which triggers another message ("The prev_revision parameter must be set"). Someone can check again for the topic-title-wikitext after the rest is fixed and this goes to QA. Previous description of the issue - moved to Comments since the current behavior is different. Log in as a non-privileged user and go to any Flow board page. Log in as Admin and go to the same Flow page that a non-privileged user is currently viewing. 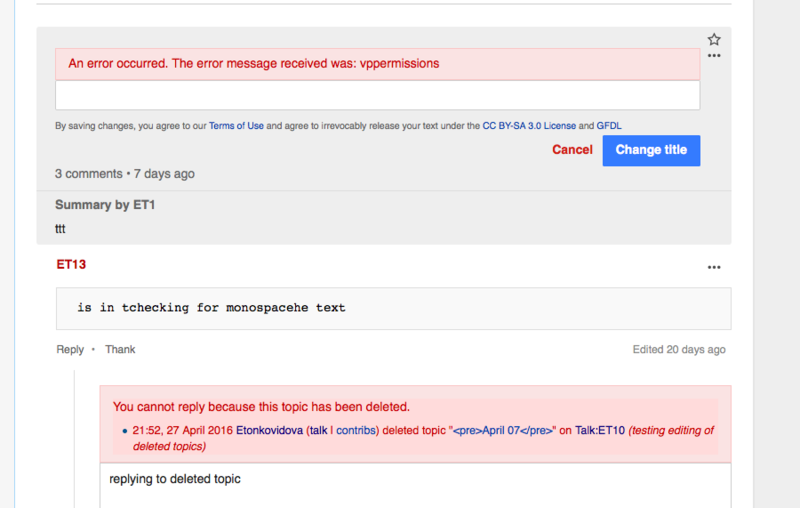 Admin deletes a topic - a non-privileged user attempts to edit or to post a reply to a deleted topic. A user receives quite few error messages (some of them malformed) and none of them is helpful. Exception Caught: Conversion from 'topic-title-wikitext' to 'html' was requested, but this is not supported.